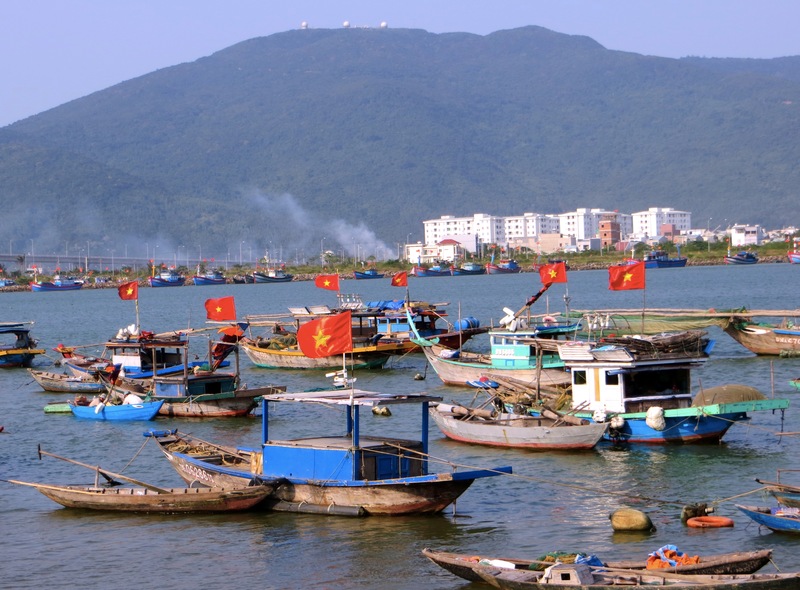 We spent a quick two days in Danang as we work our way north through Central Vietnam. 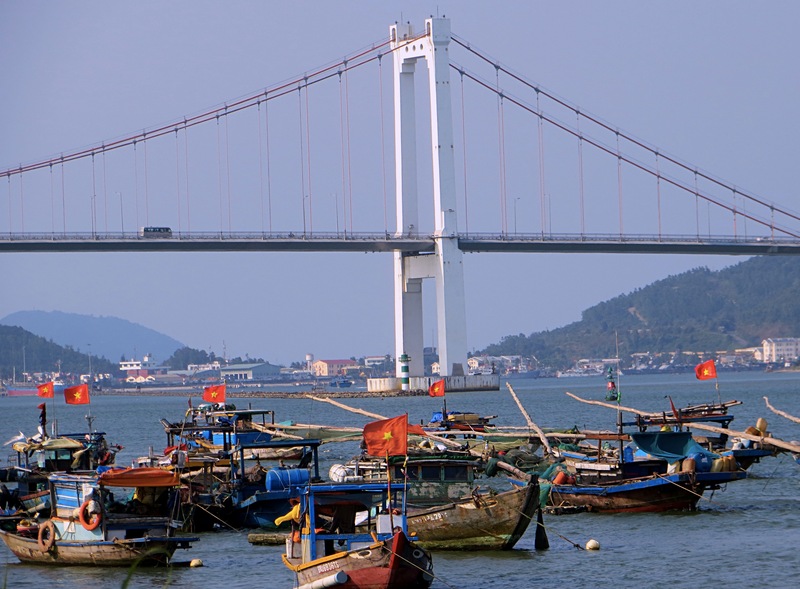 As Lonely Planet points out, though its port makes it a major economic center for the country, it isn’t much of a tourist destination; there’s just not much in terms of sights and activities and all that. Still, we wanted to stop by at least, since it had a highly rated Novitel hotel at a good price and just to see this place that was such a hub of activity during the American War. 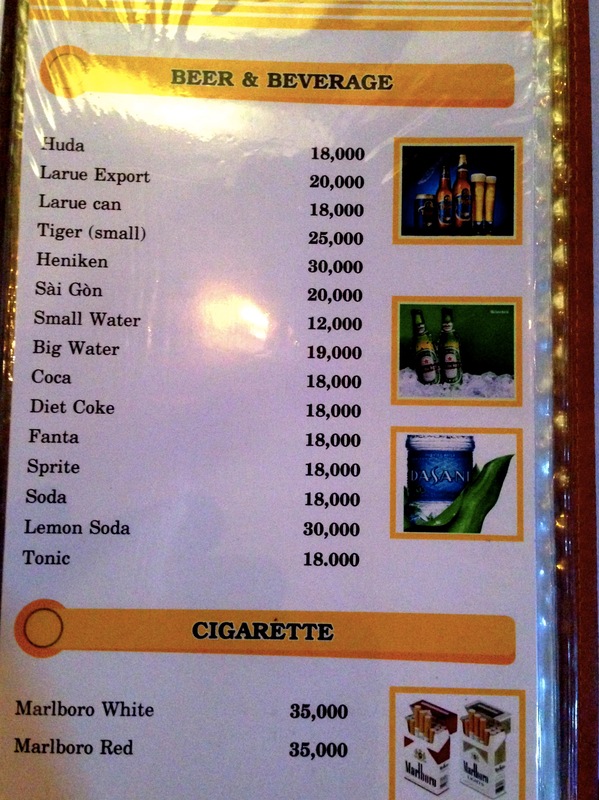 At 20,000 Vietnamese dong to a dollar, these prices at an Indian restaurant are typical. Beers are around $1, even imported beers are $1.50. And you have to love a restaurant that lists cigarettes on the menu. And we got pretty much what we expected. The hotel is a 36-floor high-rise right on the Han River with spectacular views. The most memorable thing about the city, for us anyway, was the way the city has designed and decorated the bridges across the river. One of them is made up like a huge sea serpent, while they’re all brightly lit at night with shifting colors. Made for a beautiful view, at night at least. Otherwise there wasn’t a lot. There’s a huge beach we walked to – goes on for well over a mile – but the day we were there was quite overcast and so it was pretty much empty. 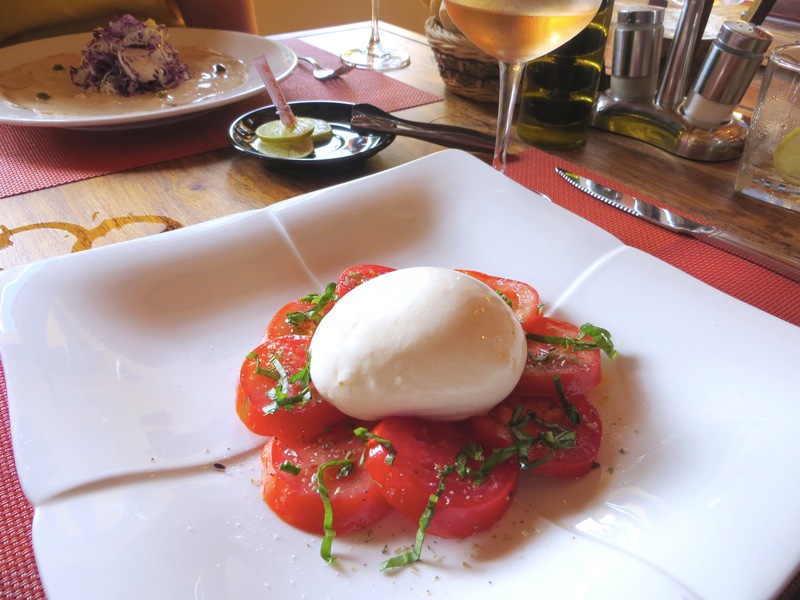 Not much of a food scene though we did find a good Italian restaurant where the Italian chef came out to chat a bit. Then it was time to leave. In some ways that was the most interesting part of the stop. We decided on the three-hour-ish public bus to go from Danang to Hue, which can always be both something of a mystery and an adventure. In this case it was a surprisingly long taxi ride to the bus station – we were pretty certain there’d been a misunderstanding and was taking us somewhere else since a bus station is rarely that far from the center of the city – and then, once we were at the bus station, a total mystery of how to find a bus to Hue. It’s not like there’s a central hall where you buy tickets; instead there were dozens and dozens of windows in smaller buildings and everyone trying to grab your bag to get you into their bus. 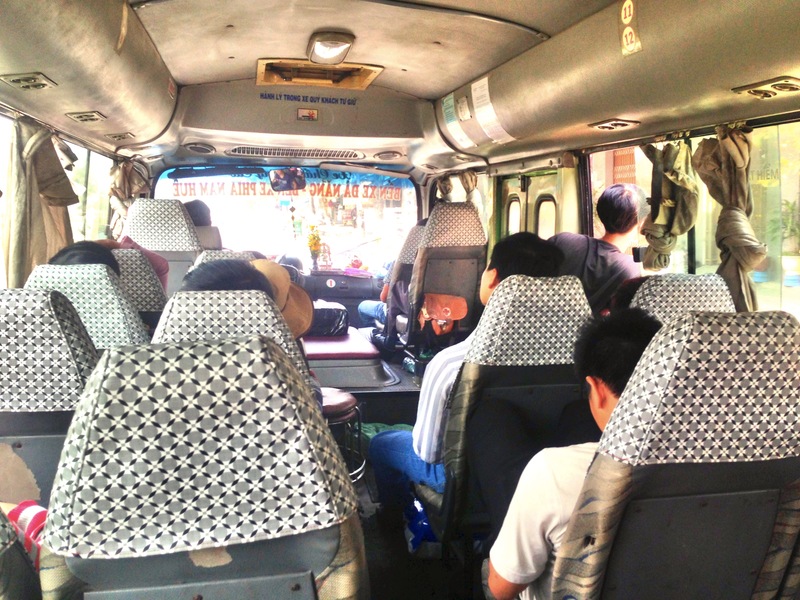 Our old, rickety bus to Hue. The guy standing at the door on the right is watching for anyone who looks as though he or she needs a ride north. Eventually we found a small 30-seat bus that was leaving in 10 minutes and paid our $3.35 each (I know, that tells you what kind of service it’s going to be) for the trip. The bus pulls out on schedule and with a bunch of empty seats; we’d assumed it would stay there until all the seats were filled. Instead it pulls out and then just crawls along – like two or three miles per hour – trying to fill up those seats. For nearly an hour. You try to convince yourself this is an adventure, this is how things work in Vietnam. The problem is that you have no idea how long this is going to take and there is no one to ask. Everyone else on the bus knows what’s going on, but they’re Vietnamese and no one speaks enough English to explain. So you sit there. Wondering. Finally, the seats are nearly all full and we take off. Now it’s a lovely ride – open windows, pleasant breeze, beautiful rice fields and lakes and big hills. And we’re off to Hue. More on that soon. 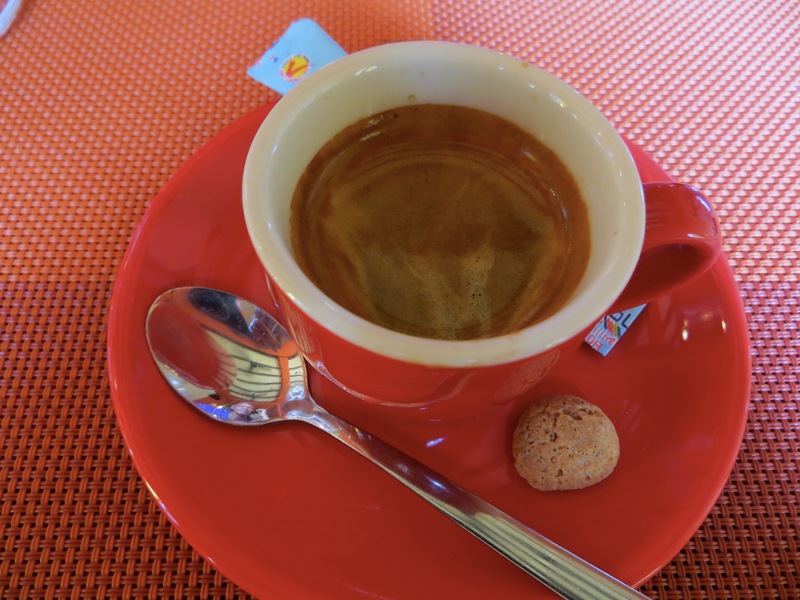 The highlight of lunch was this “correcto” – an espresso with a healthy shot of Grappa. Damn that was good! 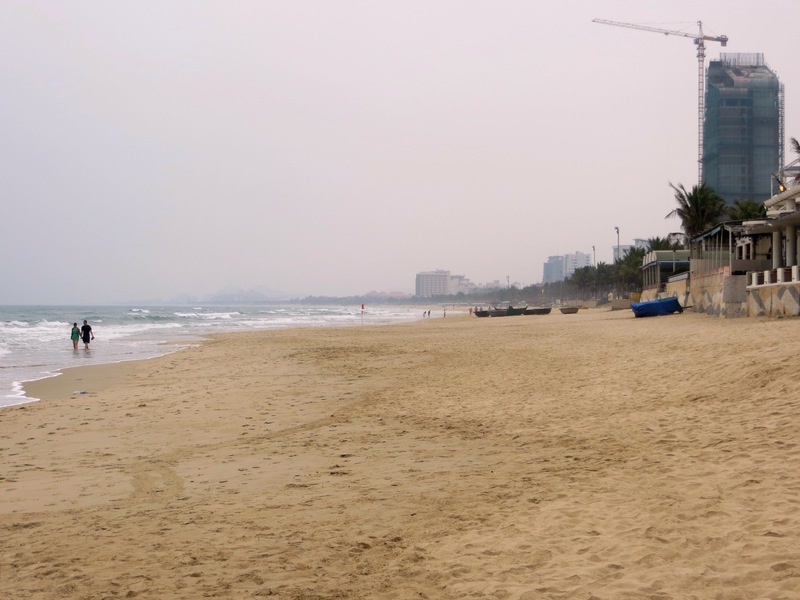 The long, long beach of Danang. Hard to believe this was the center of such fighting just a few decades ago. 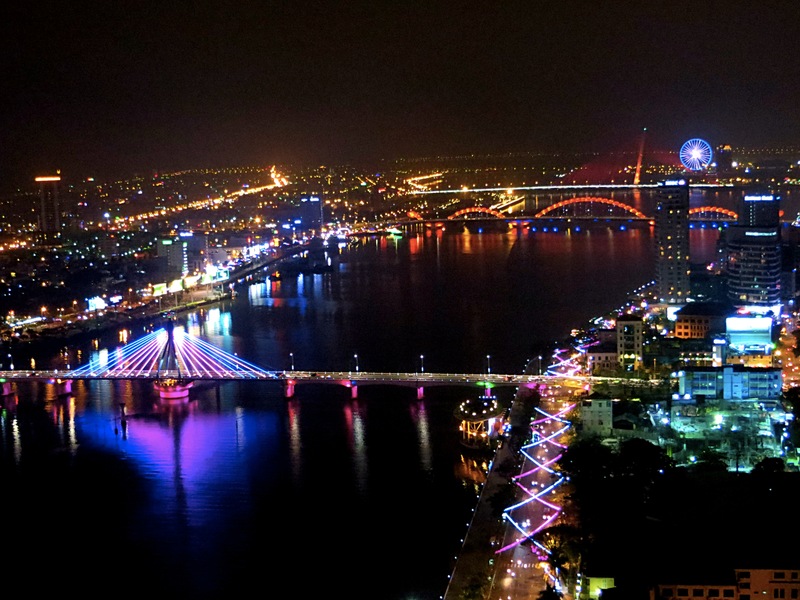 Danang is an awesome place. I’ll definitely come back to this beautiful city again.